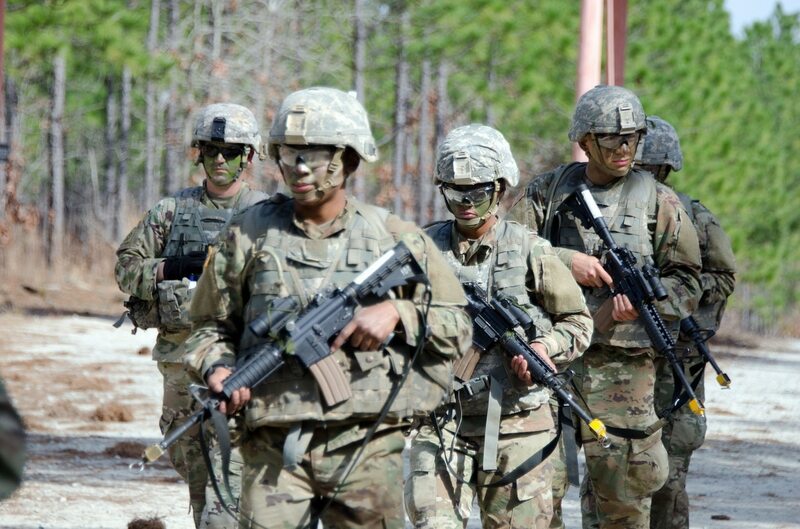 FORT JACKSON, S.C. ― It’s day three of basic training’s culminating field training exercise, and the soldiers of 3rd Battalion, 39th Infantry Regiment are lined up along the side of a road on a thickly wooded training range. It looks a lot like a scene out of “American Gladiators,” actually — two soldiers at a time are suiting up to whack each other about the head and body with foam-padded pugil sticks. The weapons are stand-ins for rifles, and the soldiers are in round one of a battalion-wide combatives competition on the road to graduation. To get here, soldiers have had to test into and complete both the Hammer and Anvil exercises, and now they’ll put together every warrior task and battle drill they’ve learned so far to see what it’s like to survive high-intensity combat when they’re hanging by a thread. That’s 44 tasks and battle drills in all. This is Fort Jackson’s second full-blown iteration of the Forge, Dougherty said, since the Center for Initial Military Training unveiled the new program of instruction in February. Previously, soldiers in their last couple weeks of training had a very different experience. The Army is in the midst of a transition that could take up to 30 years, Chief of Staff Gen. Mark Milley said, as the force shifts from focusing on counterinsurgency to sustained ground wars against enemies that are closer in size and capability. It made sense for the time and place, 3rd Battalion, 39th Infantry’s commander said. “The former event was kind of symptomatic of the counterinsurgency that we’d been fighting,” Lt. Col. Chuck Slagle told Army Times. But the Army has its eye on the future fight, and Chief of Staff Gen. Mark Milley believes that will be long, brutal ground wars in austere conditions, which frequent movements and little advantage in terms of weapons and technology. After nearly two decades of counterinsurgency, the Army is taking a step back and reflecting on what it will take to win the next war, as tensions mount with countries like Russia, China and North Korea. It’ll be nothing like the Taliban or various militias the Army has faced in the Global War on Terrorism. So, in addition to upgrading equipment, the service wants to upgrade soldiers themselves, starting with the newly overhauled basic training. 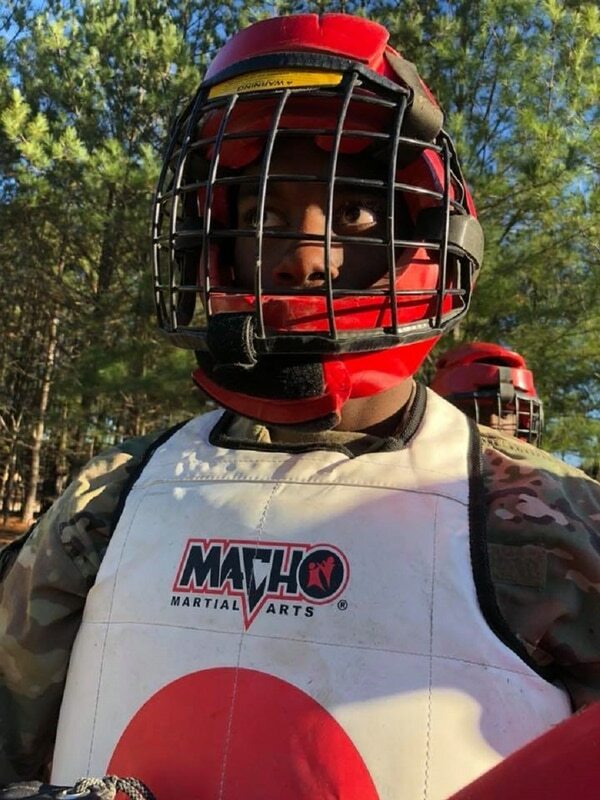 With the Forge, Fort Jackson is testing a new training philosophy: Everything a soldier learns throughout those first eight weeks, they will have to perform under pressure and be graded on to graduate. “We would teach them one task and push it aside and not even revisit it,” Command Sgt. Maj. Lamont Christian, Fort Jackson’s senior enlisted leader, told Army Times. Now, they’re getting multiple repetitions of these skills at every stage of training. And you’ll see it again at the Forge, first when you test into the exercise, and again during it. That test is an automatic recycle point, holding trainees back to work on their proficiency. “These checks make sure that they’re ready, and if they’re not, they will get the time that they need,” Slagle said, potentially preventing injuries and further attrition. This class, he said, started at 820 trainees, 74 of whom didn’t make the cut. In addition to improving skills like radio communications and shooting, while reinforcing discipline and pride through drill and ceremony training and history lessons, there is a renewed focus on instilling grit and self-care into new soldiers. “We did have a gap between the tangible requirements in the standards and some of the intangibles we were trying to achieve,” Christian said. After a multi-year review of the Army’s basic and advanced individual training programs, the service is piloting a long list of changes and tweaks, with an eye toward a full roll-out in late spring. Combined with holistic health and fitness training — in sleep, nutrition and injury prevention — trainees will use the full breadth of what they’ve learned during the Forge. By this point, he added, trainees should be proficient in everything they’ve learned, and the exercise will test how well they put together both their technical and personal growth. There’s also a possibility in the near future that basic training will become longer, to accommodate the new domains and methods of instruction.